The blue crab is a funny site to behold, walking sideways along the sand using its three middle pairs of legs, while its front bright blue pincer claws are used to defend itself and grasp prey. The species earns part of its Latin name, Callinectes, or “beautiful swimmer” from its hind appendages, which are broad and flat like paddles and make the crab a remarkable swimmer indeed. The blue crab, one of the most valuable crustaceans in the United States, is aptly described by its scientific name, Callinectes sapidus (Calli -- beautiful; nectes -- swimmer; and sapidus -- savory). Blue crabs have five pairs of legs and the first pair is equipped with pincers. They have a hard shell or exoskeleton which is brownish-green or dark green and drawn out on each side into a long spine. The underside of the body and legs are white. Male and female claws are various shades of blue on top and the tips of the female's claws are bright red. Blue crabs are found along the Atlantic and Gulf coasts. A shallow water crab, it can live in salt, fresh and brackish waters of bays, sounds, channels and river mouths. They are omnivorous, feeding on plants and animals. During the winter months, blue crabs move into deeper water and enter a state of semi-hibernation. They are commercially harvested by traps. Whole blue crabs are sold live or steamed. Sweet-tasting crab meat is available both fresh and pasteurized in the following forms: lump, backfin, special, claw and cocktail claw. Lump crab meat or jumbo lump, is the largest pieces of meat from the body and also the most expensive form of crabmeat. For overall elegance and visual appeal, lump is the top choice. Backfin crab meat is the pale ivory flakes of white body meat and is subtle in flavor. Backfin is best used for crab cakes and it offers crab meat in smaller pieces for greater versatility. Special consists of the flakes of white body meat other than the lump meat. It's good for crab soups, casseroles and dips. Claw and leg crab meat have a darker, reddish color and is more flavorful. It is best for soups, pastas, and dips. Claw meat is a favorite of many chefs because it stands up to bold seasonings that would overpower the tender succulent lump grades. Cocktail claws are bite-sized morsels perfect for appetizers. No matter which form you choose, blue crab meat is known for its delicious flavor and delicate texture. Live blue crabs should have some leg movement when purchased. Refrigerate in a breathable container such as a bag or cardboard box, and do not store directly on ice. Fresh blue crab meat should be stored in the coldest part of your refrigerator and used within seven to 10 days. Pasteurized blue crab meat in unopened containers can be stored up to six months in the coldest part of your refrigerator. Once opened, pasteurized crab meat needs to be used within three days. Soft-shell blue crab is a special delicacy produced under the watchful eye of a “crab peeler.” Blue crabs prepare for growth by breaking free from the old shell, swelling up and hardening. To capture soft-shell blue crabs, ready to molt crabs or “peelers” are held in water-filled trays until their old shell has shed. The newly emerged crab is cleaned and packed for shipment. Soft-shell blue crabs can be purchased fresh or frozen. Nutritionally, soft-shell blue crabs are low in fat, saturated fat free, high in calcium and a good source of iron. 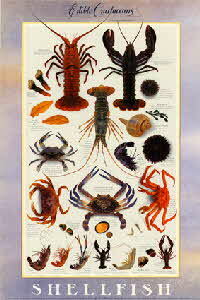 When purchasing soft-shells be sure and test the crab’s shell to make sure it is very pliable. Fresh soft-shell blue crab should be refrigerated and cooked within two days. Whether you are in the mood for sautéed, steamed or broiled, blue crabs are perfect to satisfy your seafood appetite. The tasty meat can be described as succulent, rich and creamy, melt in your mouth seafood. Blue crab is a delicacy rich in vitamins and low in fat. Delicate texture, sweet meat, low fat. Stone Crab, Golden Crab, Spiny Lobster, Shrimp. • Blue Crab, in shell: 3 to 4 whole crabs per serving. • Blue Crab, meat: 1/6 pound per serving. • Remember to purchase seafood last and keep it cold during the trip home. • Blue Crabs should have some leg movement when purchased. • Discard dead crabs and ones with broken shells. • Refrigerate in a breathable container (a bag or cardboard box). • Do not store directly on ice. • Blue Crab is available fresh and pasteurized in the following forms: lump, backfin, special, claw and cocktail claw. • Pasteurized blue crabmeat in unopened containers can be stored up to six months in the coldest part of your refrigerator. • Once opened, use within three days. • Fresh Blue Crab meat should be stored on ice in the coldest part of your refrigerator and used within seven to 10 days. • Soft-shell Blue Crab is available live, fresh or frozen. • Fresh soft-shell Blue Crab should be refrigerated and cooked within two days. • Keep raw and cooked seafood separate to prevent bacterial cross-contamination. After handling raw seafood thoroughly wash knives, cutting surfaces, sponges and your hands with hot soapy water. • To cook: Add to boiling seasoned water and simmer for 12 to 15 minutes. • Cooked meat: Toss with salad greens, use as a topping on pizza, make crab cakes or use in dips and spreads.